The 22nd-ranked Northwestern Wildcats used a furious third quarter rally to overtake the 17th-ranked Utah Utes, 31-20. 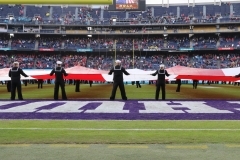 Led by a defense that forced timely turnovers and 2018 SDCCU Holiday Bowl Offensive MVP Clayton Thorson, the Wildcats scored 28 unanswered points in the third stanza. DraftNasty's Corey Chavous takes us inside the game with this photo collage. 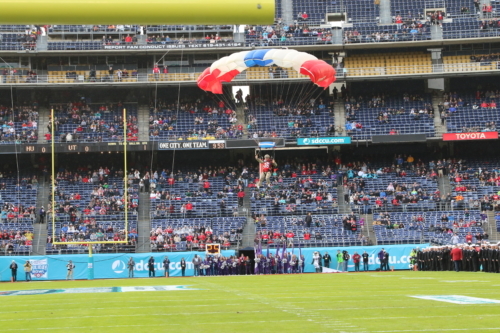 The Frog-X parachute team came into the stadium with a focus on entertaining the crowd. 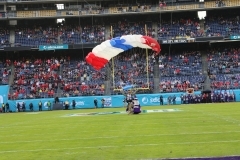 This member of the Frog-X parachute team represented the Northwestern Wildcats and landed on the field effortlessly to the delight of the crowd. 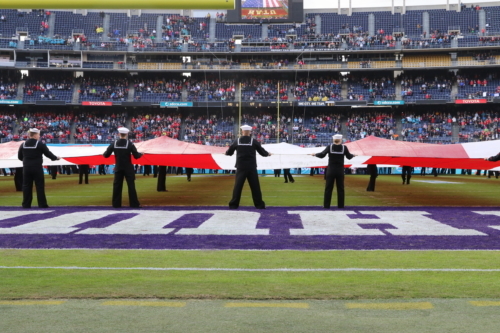 The Navy held up the American flag to give the fans in the stands a full-sized view. 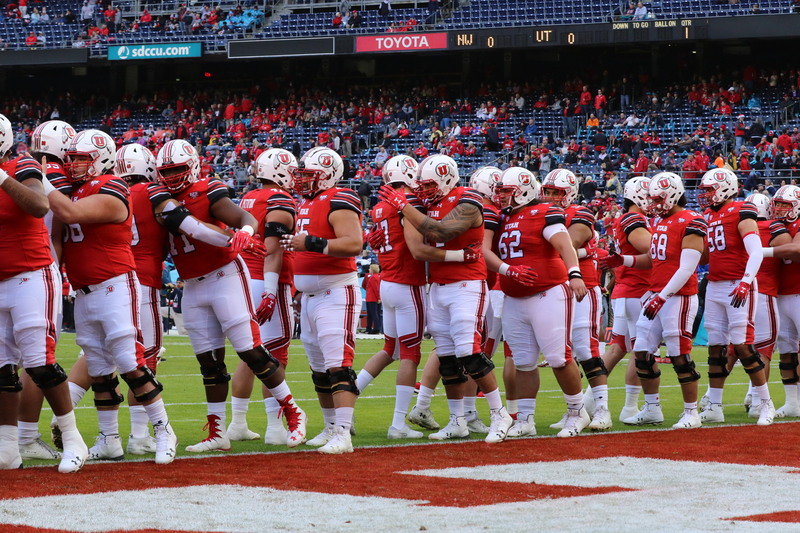 The Utes' team unity was evident during the pregame. 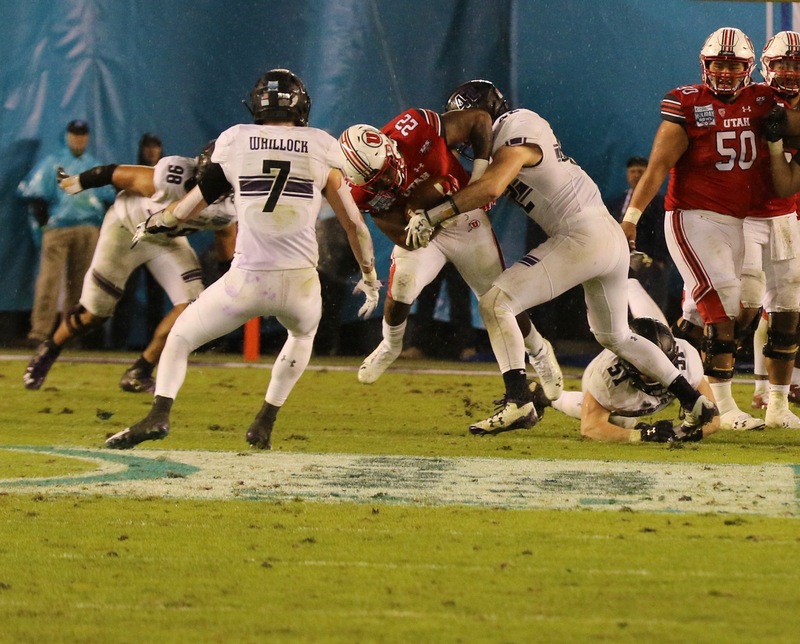 Utah All-Pac-12 linebacker Chase Hansen, pictured, would have been huge for the Utes in this game but did not play due to an undisclosed injury. 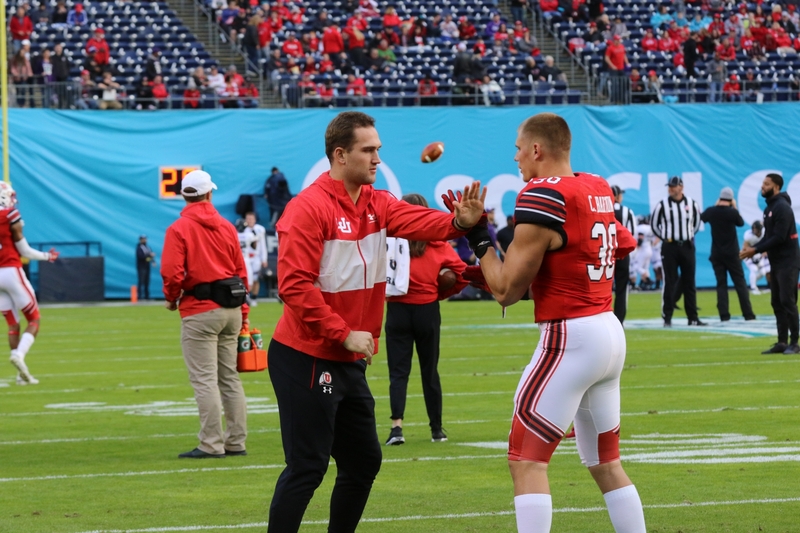 The player he's doing drills with -Utes captain and LB Cody Barton- finished his 2018 campaign with 116 tackles, four quarterback sacks, 10.5 tackles for losses and six pass break-ups. Despite Barton's presence most of the night (8 tackles, 1/2 sack, 1/2 TFL), Northwestern QB Clayton Thorson was still able to get this pass off early in the game versus the blitz. 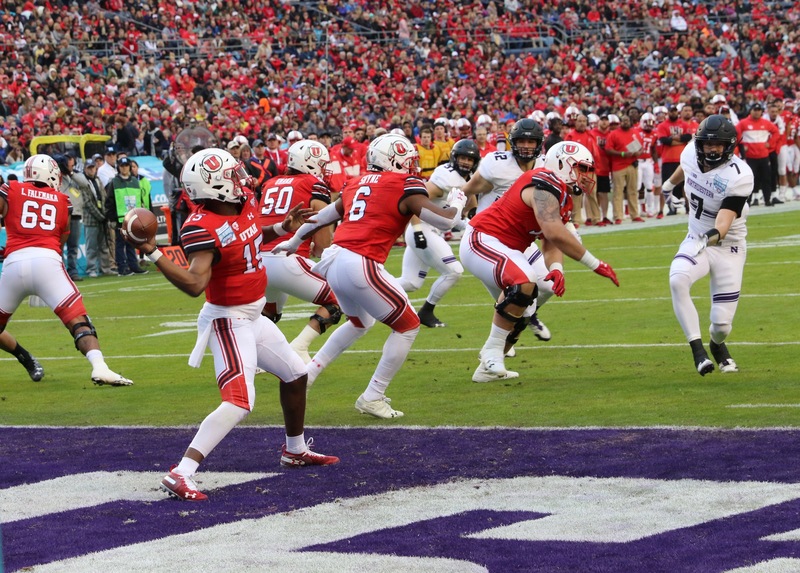 Utah freshman quarterback Jason Shelley once again started for an injured Tyler Huntley. Shelley passed for 302 yards (60%), 2 TDs and 2 INTs. 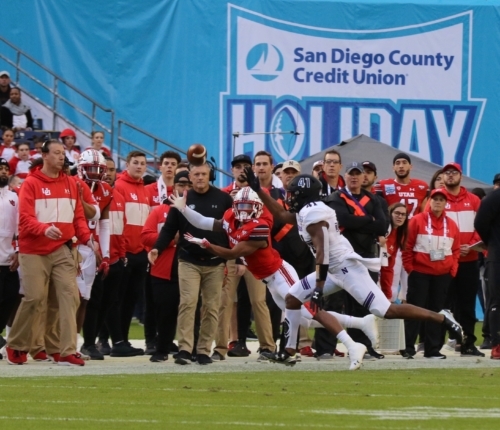 Utah running back TJ Green couldn't quite get to this pass on the sidelines in the first quarter of Monday's action. 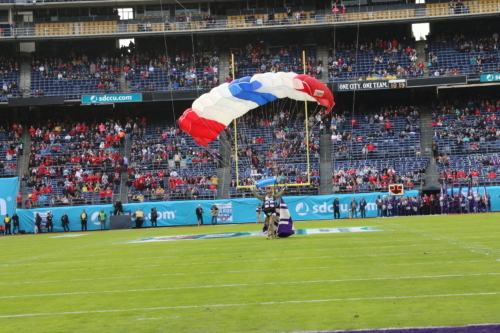 Utah placekicker Matt Gay (No. 97 pictured) -the 2017 Lou Groza Award winner- nearly had this kick blocked by Northwestern DL Ben Oxley (No. 94 pictured). Gay had three kicks blocked in 2018. 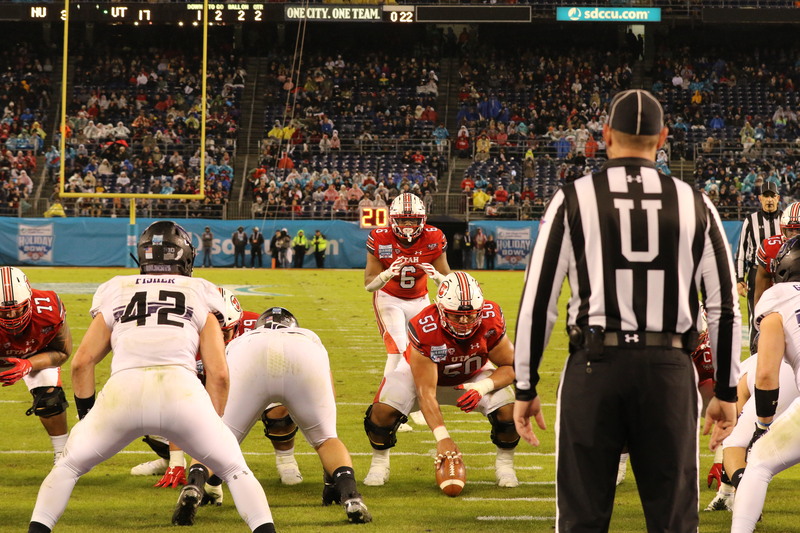 Utah's Bradlee Anae (No. 6 pictured) forces a fumble versus Northwestern running back Isaiah Bowser (No. 25 picutred) in the fourth quarter. He finished 2018 with 51 tackles, eight quarterback sacks, 15.5 tackles for losses, two forced fumbles and three pass break-ups. 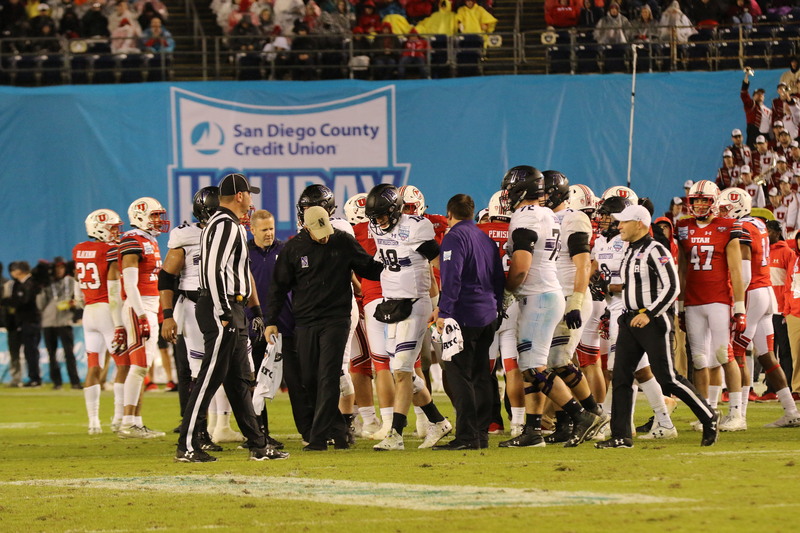 The Utes tried to put Armand Shyne in the Wildcat near the goal line, but Northwestern linebacker Paddy Fisher was on his game most of the night. Fisher (No. 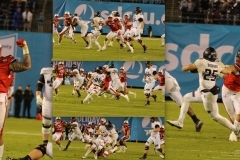 42 pictured tackling Devin Brumfield in the fourth quarter) finished second on the Wildcats in tackles this year (117). In the Holiday Bowl, he had 13 tackles, 1/2 tackle for loss and one forced fumble. 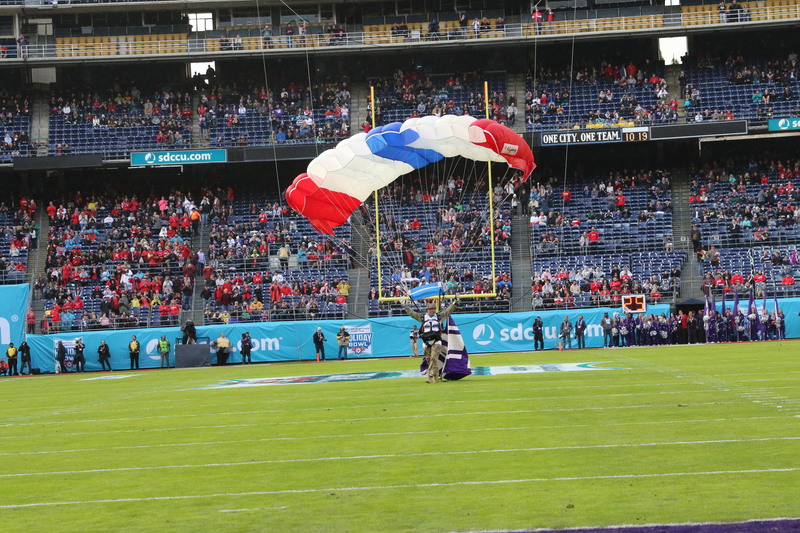 The Wildcats were down 20-3 at halftime before a furious third quarter rally featured 28 unanswered points. 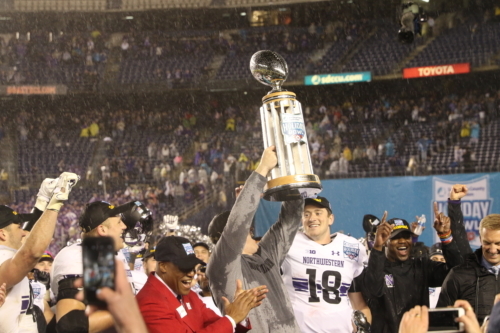 Northwestern quarterback Clayton Thorson (No. 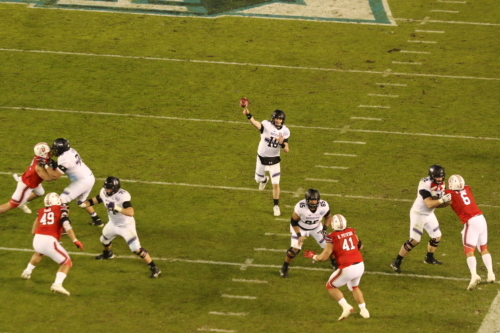 18 pictured) threw this third quarter pass to offensive lineman Trey Klock (No. 39 pictured) to put the Wildcats up 24-20. What a moment for the senior Klock, who battled injuries as a former offensive lineman for the Georgia Tech Yellow Jackets. 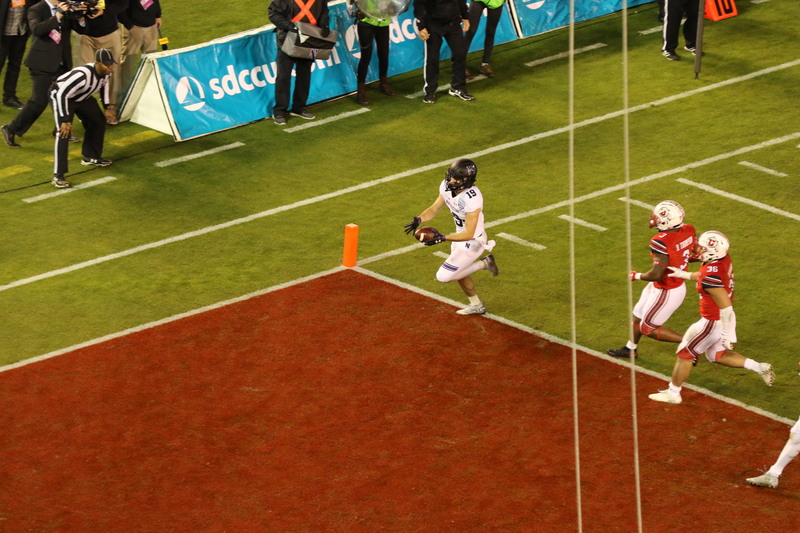 Northwestern's Riley Lees (No. 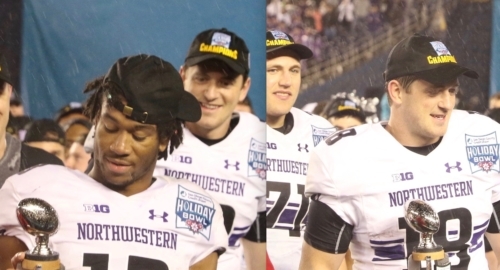 19 pictured) is sort of a jack of all trades for the Wildcats. The team's starting punt returner also lines up in the Wildcat and scored on an eight-yard touchdown late in the third quarter to put the team up 31-20. 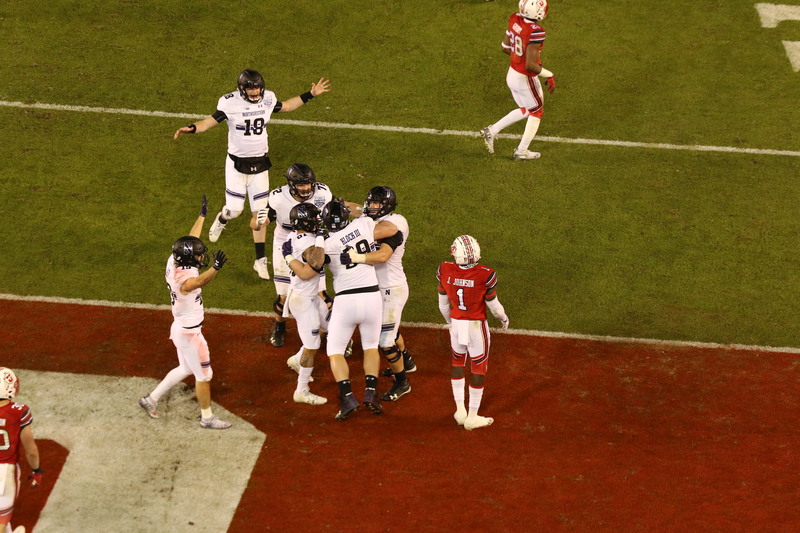 Despite getting banged up late in the fourth quarter after a huge hit on the sidelines by Utah safety Marquise Blair, the game was a redemption for Thorson (No. 18 pictured). He was injured (torn ACL) in last year's 2017 Music City Bowl. Pat Fitzgerald enjoyed the Gatorade bath late in the fourth quarter. 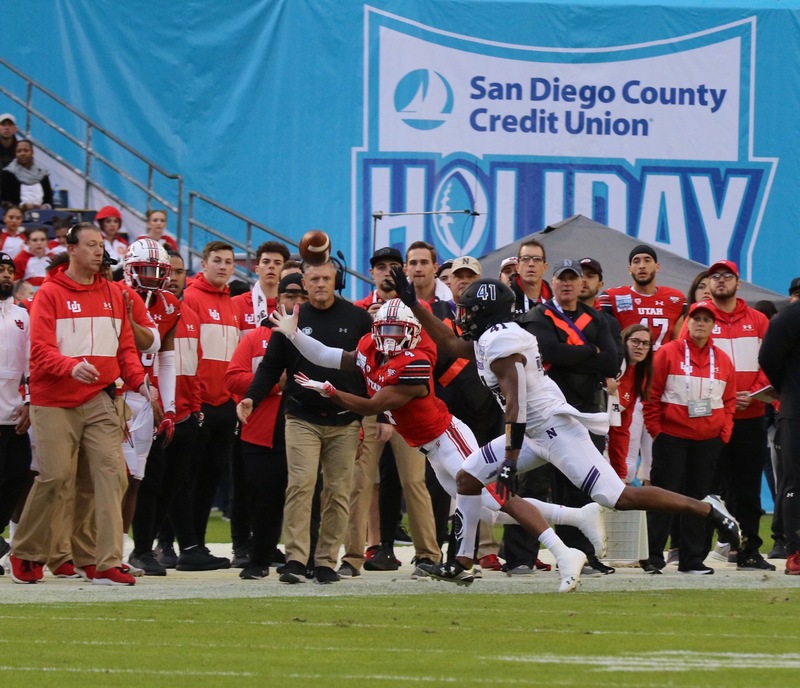 Sophomore safety JR Pace was named the 2018 Holiday Bowl Defensive MVP (7 tackles, 1/2 TFL, 34-yard fumble return, one interception and one pass break-up). 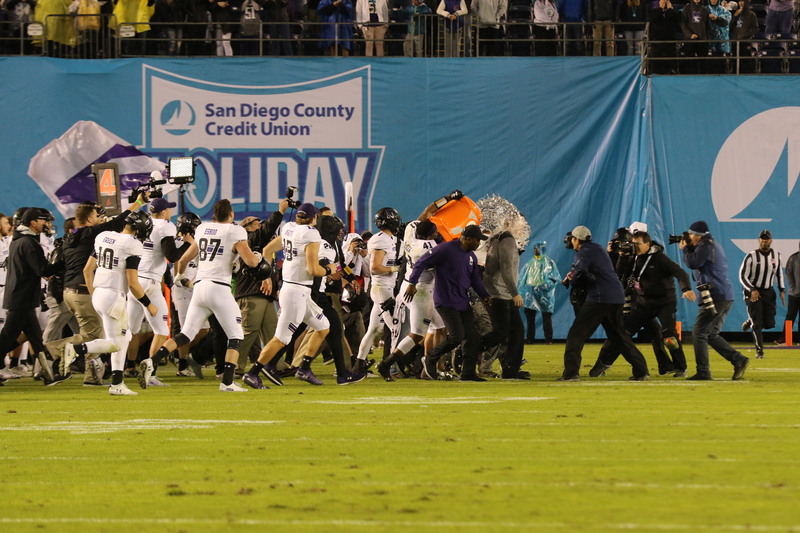 Thorson was named the 2018 Holiday Bowl Offensive MVP after completing 21-of-30 passes for 241 yards, two touchdowns and one interception. 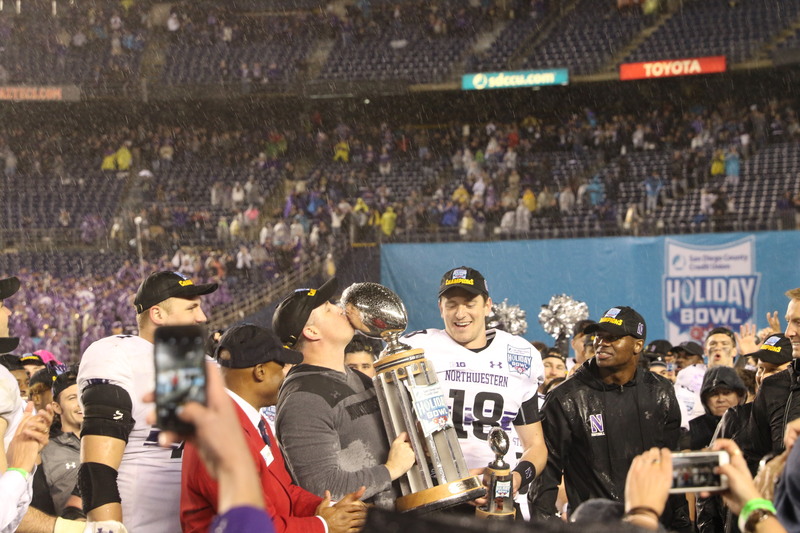 Pat Fitzgerald held up the Holiday Bowl trophy in style as his senior quarterback Clayton Thorson approved. Northwestern HC Pat Fitzgerald kissed the Holiday Bowl trophy after the game. After a Sunday afternoon 21-18 defeat at the hands of the New Orleans Saints (1-1), the Cleveland Browns (0-1-1) released former seventh-round draft pick Zane Gonzalez. Pittsburgh Steelers OLB T.J. Watt blocked a potential game-winning 43-yard field goal by Gonzalez in an overtime season-opening tie versus the Browns. 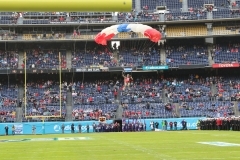 He then missed a go-ahead extra point and potential game-tying field goal in the fourth quarter of Sunday's three-point loss to the Saints. Gonzalez missed two extra points and two field goals in the Superdome. The kicker that the Browns signed to replace the NCAA's all-time leader in field goals didn't leave college with the same resume', but his work in college was still impressive. 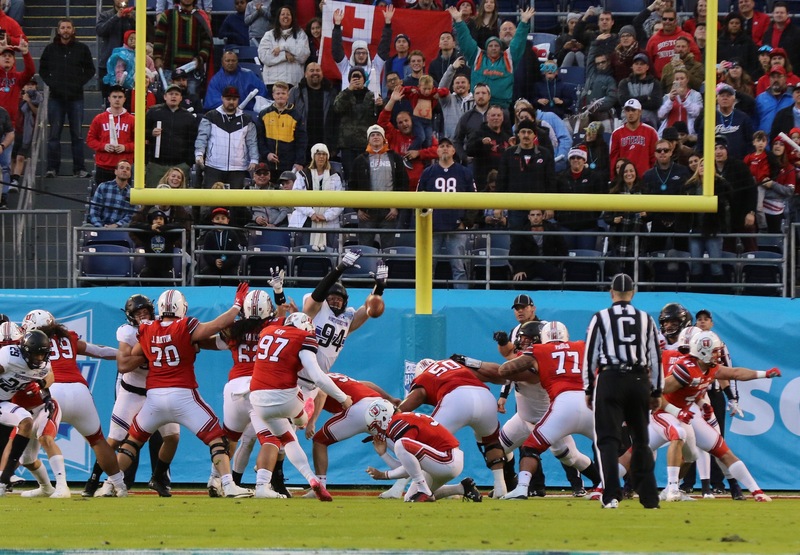 Former FAU kicker Greg Joseph had a knack for forcing teams to drive the length of the field versus the Owls 34th-ranked scoring defense in 2017. Here's a quick snapshot of Joseph, our sixth-ranked kicker in the 2018 NFL Draft class. What makes this player Nasty....(Strengths): He’s a two-by-three-yard kicker who aligns right outside of the LT (left tackle). 2 ¼-step placekicker with ample leg strength. Kicked a 54-yard FG with at least six yards to spare vs. Navy in 2017 (3-step). Rarely punches at the ball. Keeps his shoulders parallel during his motion. Kicked the ball well in windy conditions vs. Western Kentucky in 2017. Hit two 40-yard field goals from both hash marks (2nd FG-RT hash, 48-yd FG inside left uprights; 3rd FG-left hash, 42-yd FG). Posted a 76-percent touchback rate on KOs in 2017. Capable of kicking balls in the 75-to-77-yard range with 4-second plus hang times (77 yards, 4.06, Tulsa ’15; 77 yards, 4.03, Tulsa ’15). 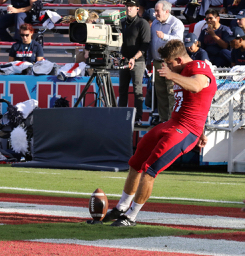 Posted five touchbacks vs. North Texas in 2017 and three in the 74-to-77-yard range. He’s capable of kicking directionally to his right on kickoffs. Weaknesses: Inconsistent in 2015. When he drags his first step (plant foot), he’ll push kicks to his right from the collegiate left hash (missed 40-yd FG, Tulsa ’15). 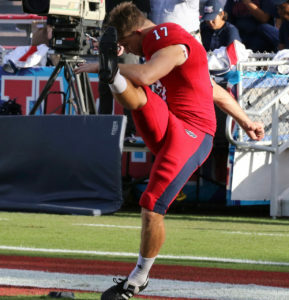 Some of his kickoffs were held up in the wind vs. Western Kentucky in 2017 (4th KO-directional right, 60 yards, 4.03 hang). He also had his fifth kickoff get held up in the wind (vs. WKU ’17). Time to get Nasty...(Our Summary): Joseph’s ability to drive kickoffs through the end zone could help him vie for a roster spot alone. He has been better in each of the last two seasons with accuracy but there are a number of pressure performances missing on his resume’. A four-year starter with upside, the Johannesburg native will need to monitor the location of his plant foot moving forward. DraftNasty's projection: If there's a significant concern for the Browns, it is that Joseph -who hit on all three of his field goals for the Miami Dolphins in the 2018 preseason- simply didn't have an extreme amount of pressure-packed field goals at any time during his collegiate career. 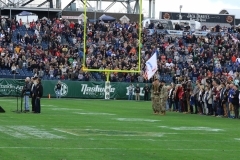 In addition, he missed seven kicks in the all-important 30-to-39-yard range during his time in school. This has relevance due to the NFL's 33-yard extra point attempts. After playing in the relatively weather-friendly environments of Boca Raton, Florida in college and then Miami, Florida this preseason, will he adapt to the ever-changing conditions off the lake in Cleveland, Ohio? This was somewhat of a concern for Gonzalez up until he handled it admirably as a rookie in 2017. 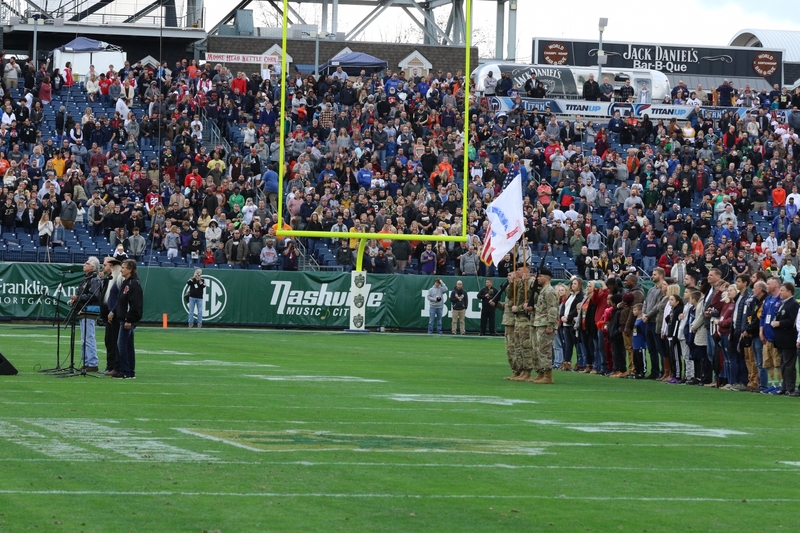 We were able to see Joseph kick twice in person during his time in school and he impressed on both occasions. 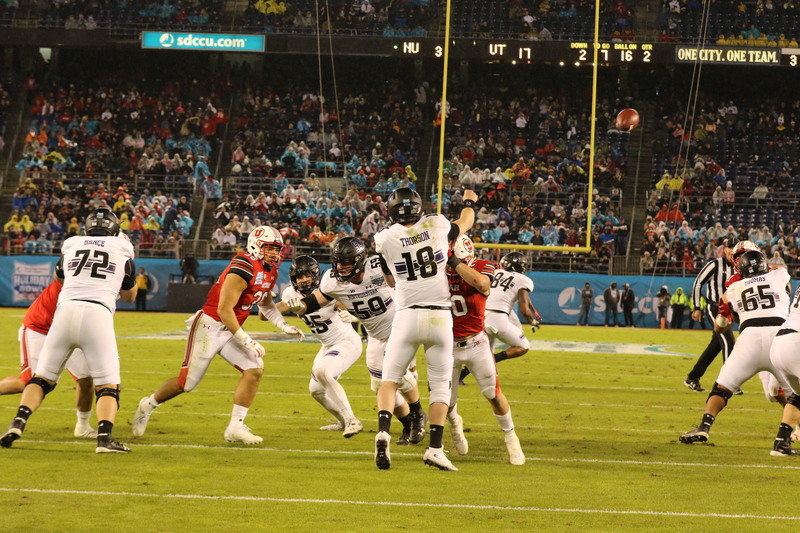 He handled a torrential downpour seamlessly versus Marshall in 2017 and even kicked a 31-yard field goal after three consecutive timeouts by Thundering Herd head coach Doc Holliday right before the end of the first half. 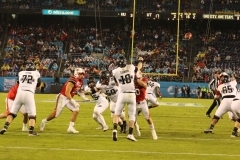 Joseph posted six touchbacks on 14 kickoffs in the preseason and matched his collegiate career-long with a 54-yard field goal versus the Carolina Panthers in Week 2.